One of my favourite local beauty destinations – and one I’m always recommending, without fail – is Chuan Spa at The Langham. Every treatment have ever experienced there has been first class, and they are always introducing new ones that are as luxurious as they are unique. 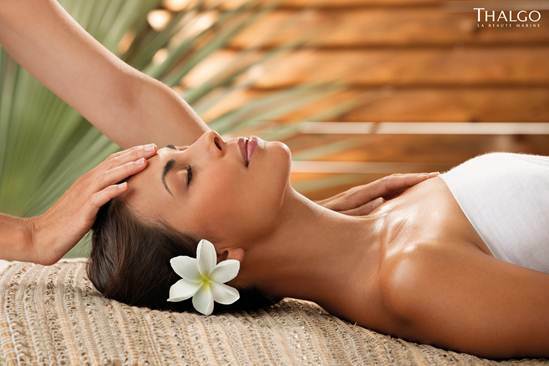 Polynesian-style treatment called the Polynesia Spa Ritual. It’s the work of the highly respected Thalgo spa brand, who has drawn inspiration from Polynesian beauty rituals to create something completely indulgent and unique, that has to be experience to be believed. Polynesia has given Thalgo its main active ingredient for the range: the Algomonoi, a combination of algae and Monoi. There is perfect harmony between Tahitian Monoi, with its protective and hydrating effects, and the brown algae, rich in trace elements such as magnesium, which has excellent de-stressing properties. The treatment begins with a stop on the Vanilla island with an Exotic Island Body Scrub. This exquisite scrub of Bora Bora white sand, sea salt, and coconut extract mixed with soothing Monoi and Vanilla oils smoothens and softens your skin, making it soft and radiant. My therapist Jasmin was an absolute expert when it came to wielding this scrub, leaving my skin soft as the baby’s proverbial and smelling amazing. The voyage continues on the Lagoon Island with “Lagoon Water” Bath Pebbles positioned beneath your back while you luxuriate in a sapphire blue-hued, tiled bath. The effervescent pebbles generate hundreds of relaxing micro-bubbles on contact with water, and also release their beneficial active ingredients to protect and moisturise the skin. I spent around 15 minutes in near darkness and seriously didn’t want to get out. Next up was the Mahana Massage, a slow yet powerful massage with pouches of warm sand. This sends relaxation deep into the muscles and is a bit like a hot stone massage with a twist. The voyage ends with an application of Polynesia Sacred Oil, enriched and scented with Tahitian Monoi. This leaves your skin with a yummy pearlescent glow and – once again – smelling like heaven. The cost of this slice of gorgeousness: Single NZ$260.00 or Couple NZ$495.00, making it a great Christmas or New Year’s treat for yourself or a friend. So what are you waiting for? We’ve booked in to spend New Year’s Eve at The Langham this year and I may just swing by for another!